Oakland based artist Charles Aweida is manipulating the physical through his robotic language to create fine art. A man well versed in a myriad of skills, Aweida’s latest and most unique venture is his focus on creating artwork through technology out of his home studio in Oakland. With his robotic arm, Uma, Aweida is taking on digital interface in a new direction. Perhaps the quintessential embodiment of the modern artist and the effect the current digital age has on the industry, Aweida is a clear innovator. It comes as no surprise that he was discovered through, presumably, Instagram and will soon have his work in an exhibition at the Sharjah Art Museum in the United Arab Emirates next month. We spoke to Aweida in his home studio while he showed us how he programs, creates, and speaks the language only he and Uma know. Can you tell me a little more about your background and how you got to where you are now? I have a background in various creative mediums—architecture, industrial design, illustration, motion graphics, user interface design, creative coding, digital fabrication, photography, film and fine art. While exploring creative mediums, I've always been fascinated with technology and its ability to push them to new heights. That’s naturally led me to software, coding, robotics and other forms of technology that can be leveraged creatively. It’s this magic combination of creative mediums intersecting with science and technology that has led me to where I am now. How and why did you get into working with robots? What kind do you use? The first time I was exposed to an industrial robot was in grad school at Carnegie Mellon. I walked by the fabrication lab and saw a large ABB six axis robot behind a glass window. I immediately became enamored and told myself I had to start creating with it. There was a digital fabrication course utilizing the machine for architectural purposes, however, I had no interest in the curriculum. I was bent on using the machine to create fine art. The university was cool with me enrolling and modifying the course. I would create various experiments and concepts with the robot then run them over to the art department for open critiques. I did this throughout the semester. It was the most engaged I’ve ever been. After grad school, I couldn't imagine not continuing what I started so I cashed out my 401K and bought a Kuka Agilus 1100, six axis industrial robot which I’m still using today. I also create with other machines including a custom vibratory feeder which hands the robot components to assemble. Additionally, I use robotic tracks to film and capture my work. All these machines talk to one another and work together. I’m continuously evolving my tools and process. I have some exciting new robotic methods in the works so stay tuned. You've explained your work as manipulating the physical through robotics. Can you go into more depth on what that means? My work originates from patterns and systems inspired by the natural world. For these systems to evolve into a piece of art, they must be translated from a digital form to a physical form. This happens through robotics by transforming, assembling and manipulating physical materials. In other words, robots serve as a bridge between the concepts I produce digitally and the final works I produce physically. Robots serve as this amazing mechanism for making digital dreams physical realities. Where do you find most of your inspiration stems from? There's two primary aspects to the work I produce- the visual and the technical. From a visual arts perspective, the majority of my conceptual thinking is inspired by systems from the natural world. When I say systems, think water particles working together to form clouds or cellular structures coming together to form organisms. If you look at my work, it’s very much the same. All of my work is comprised of a multitude of simple elements combined to form a larger, more complex, system or assembly. The natural world is endlessly fascinating. The second dimension to my work is the technical aspect — how its engineered and fabricated. I take tools primarily developed for automation such as robotics and custom actuated machines and leverage them for the visual arts. I’m continuously inspired by science, engineering and advanced manufacturing as a source of inspiration. Ultimately, it’s about these two disciplines- the arts and engineering coming together. It’s this intersection of inspiration where the magic lies. What goes into creating your pieces? How long does one piece take to make? In terms of materials, the majority of my work at the moment consists of high density urethane substrates and custom steel nails. The nails are inserted into the substrate by two machines which work together. 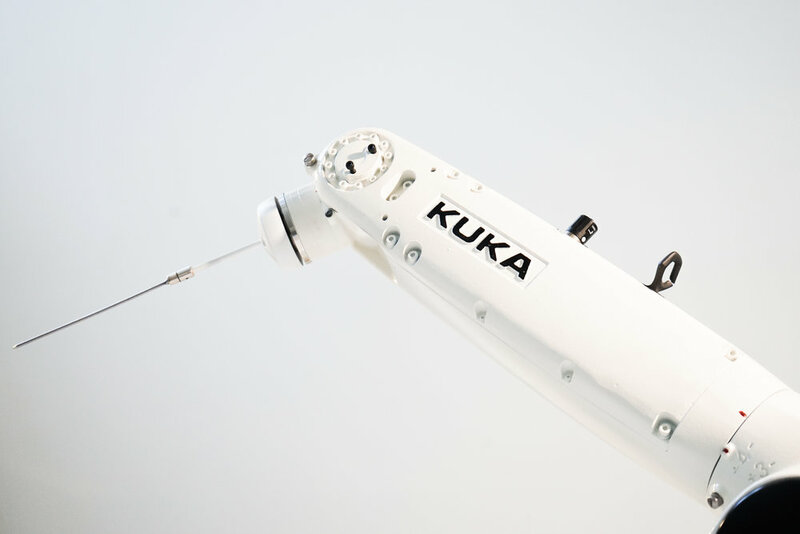 One is a Kuka Agilus six axis industrial robot. The other is a custom engineered vibratory nail feeder which hands nails to the robot. Smaller pieces with 1,000-2,000 nails take 1-3 hours to fabricate. My recent museum exhibition pieces are made up of over 8,000 nails. Each took roughly 16 hours per piece. I’m purposefully working on concepts with self-defined constraints in terms of materials and color, this narrows my focus to form and the essence of the patterns I create. Overtime, I’ll introduce new materials, colors and methods for visual effects. Would you consider your art more of a side project or a larger part of your career? I know you have other projects going on as well. Fine art is top of mind for me, it’s my primary passion. There's nothing I would rather be doing with my time. With that being said, robotics and the tools I use to create are very expensive so at the moment I’m designing and developing technology to supplement my income and keep the lights on. My hope is to become a full-time artist as soon as possible. You’re going to Dubai soon to show your work. Where will it be shown and how did that opportunity come about? I’ll be in Dubai the tail end of December participating in the Horizons museum exhibition put on by the United Arab Emirates. I’ll have 3 - 4’ x 8’ pieces comprised of over 15,000 steel elements on display at the Sharjah Art Museum Dec 19-Jan 19. I believe the UAE discovered me through Instagram, however, I’m not entirely sure. Instagram has been my primary channel for sharing my work and connecting with the world. What do you have to say to those that criticize technology being used to create art? I would say it’s worth having another look with an open mind. It’s important for artists to leverage the power of tools to create. This has been happening since the origins of art with paint brushes and chisels. It’s silly to think the tools, process and mediums artists use to create must be confined to methods invented thousands of years ago. Although some may be critical of technology and art I believe my work is part of a very natural progression — I’m an artist of today using the tools of today. // cka.co, instagram.com/aweida﻿; Photography by Anthony Rogers.